Midwest Dental Center keeps up with the latest technology to ensure we can always provide the very best, most comfortable care for Midwest City, Del City, Oklahoma City, and all surrounding communities. From our intraoral camera to digital x-rays and one-visit dentistry, we are changing the standard of dentistry with our cutting-edge approach. Keep reading to learn more about our state-of-the-art care, and then schedule an appointment today! When a picture is worth a thousand words, our intraoral camera saves the day. It’s a small, handheld tool that is tipped with a camera we use to capture images of your teeth and gums. The digital picture is then transferred onto a screen at your chairside, allowing you and Dr. Kendrick to discuss your issue and the proposed treatment plan together. We know when you are fully involved in your dental care, the overall outcome is greatly improved. Traditional radiography has long been used as a way to look beneath the visible surface of your teeth and oral structures. But today, there is a better alternative. 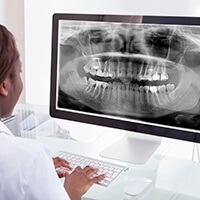 Digital x-rays are available almost instantly, easily transferred between dental offices, and stored digitally. But you’ll love most the fact that digital x-rays greatly reduce your and your family’s exposure to radiation. Because radiation builds up in the body over time, that reduction makes a big difference for children, especially. 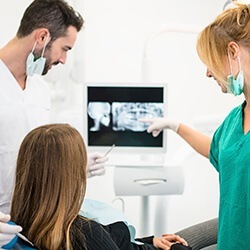 Dental implants require advanced treatment planning, and digital x-rays are just not enough to fully prepare and plan for your new tooth replacement. To ensure we provide the best in implant dentistry, Dr. Kendrick has invested in the CT (commuted tomography)/cone beam scanner, a special x-ray that creates a three-dimensional rendering of your teeth and jaw. It’s not exactly the same as a CT scan you may be familiar with, but the images it produces are similar. With the information gathered from the cone beam scanner, your dentist can see the teeth, neural pathways, jawbone, and all soft tissues in one comprehensive image. Using this highly accurate information, your dentist creates in-depth treatment plans for superior outcomes. 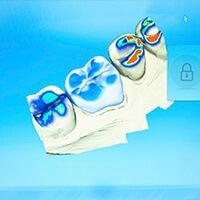 CEREC (chairside economical restoration of esthetic ceramics) makes one-visit dentistry possible. Using computer-aided design and manufacture as well as our in-house milling machine, we can plan for and place your crown or bridge in just one visit to our office. That means no follow-up appointment, and no need for a temporary restoration worn in between! 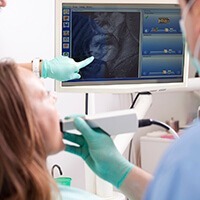 As the field of dentistry has progressed through the years, one of the most significant technological advances has come in the form of high-powered microscopes. 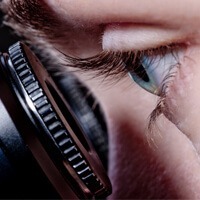 These microscopes allow Dr. Kendrick to enhance and magnify his view of your mouth and teeth. While the normal naked eye can spot problems, the microscope allows our team to view even the smallest problems, preventing future dental work. With views magnified between three and twenty times beyond normal, no occlusion is safe! Through the use of the microscope, Dr. Kendrick is able to better provide restorative dental care for all of his patients. Dr. Kendrick firmly believes in the use of technology to better serve all of his patients, providing the best care possible for you!